Wireless headsets are more of a convenience device than something you need. It offers portability and can even improve your overall gaming experience provided you buy the right headset for your gaming console. Just remember to keep an open mind as you won't get the same quality as a wired headset. The Siberia 800 from SteelSeries isn’t a brand-new model. In fact, it was previously known as the SteelSeries H Wireless. It is comfortable around the ears and delivers 7.1 surround sound through powered drivers that can run for a good 20 hours on full charge. SteelSeries makes good gaming products that combine ergonomics with performance, and the Siberia 800 is no different. Yes, this headset does cost a lot, but it also offers the best compatibility across the spectrum with its own digital processing unit built into the adapter that works with PC and PlayStation 4 though you won’t get microphone functionality with Xbox One. Perfect for all platforms, works straight out of the box using multiple user profiles. Swappable extra battery included in the pack increases total battery life. Clear microphone with noise cancellation. Excellent sound isolation with minimal sound leakage. Costs a lot of money and doesn’t offer complete Xbox One support. Can feel uncomfortable first couple of days. We felt the Astro Gaming A50 2nd generation headset to be a bit bass heavy. 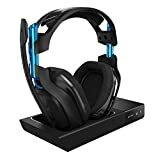 It uses a base station to charge the headset and connect to your gaming console. Thankfully, Astro provides two editions of the docking station, one for PlayStation 4 and another for Xbox One. If you need compatibility with both consoles, just get the Xbox One, which does an excellent job on PlayStation 4. The headphone fits comfortably over the ears, and though it is entirely made from plastic, the sound isolation is good. In fact, wearing the headphones transports the wearer into another world where sounds beautifully describe all that there is to experience. Virtual 7.1 surround sound works wonders, and the microphone is just too good at this price point. Two bundles, one for Xbox another for PlayStation ensures everyone gets to use the surround sound technology and mic. Comfortable design that feels right from the first usage. Charging dock doubles as the connector for your gaming console. Bass is on the heavy side. The battery doesn’t hold up beyond 8 hours of continuous gaming. When it comes to affordable headsets SteelSeries is a good pick, and the Arctis 7 is, in our opinion, the best wireless gaming headset. It works wirelessly with 2.4GHz USB dongle and connects to non-compatible consoles with a 3.5mm adapter. Basically, this headphone will work with all devices though you lose surround sound technology and a bit of sound stage when using the adapter. As far as fit goes, it sits well on the head thanks to the ski-google like a headband that keeps the steel band away from direct contact. The Arctis 7 is a good choice for gamers considering what you get for the money you pay. No wonder it won the Red Dot Design Award in 2017. Good comfortable design with adjustable headband. Controls are available on the headset. Excellent sound reproduction and clear mic. The earcups are a bit shallow for our liking. 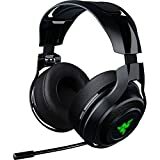 While not the best sound stage, the Razer Man’O War does better than costlier headsets in reproducing the battlefield experience. If you are expecting spectacular music though, look elsewhere. This headset is meant for serious gamers as the microphone suggests. It has active noise cancellation and helps deliver crisp voice over the background noise. The Razer Man’O War would be our best wireless gaming headset if it had cross-platform support. Unfortunately, it uses a 2.4GHz USB dongle that works well with PC and Mac but has limited functionality on a PlayStation 4 as you lose the surround sound abilities. Moreover, this headset cannot work with smartphones, Xbox consoles and other devices that do not support audio over USB. Lightweight and comfortable over the ears with a sturdy design, retractable microphone. Digital 7.1 sound stage with 20 hours of wireless gaming. Doesn’t work with Xbox, tablets or smartphones. Sound quality lacks preciseness when listening to music or watching movies. 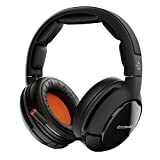 SkullCandy PLYR1 looks good and offers good value for money. It works across all platforms either using the 2.4GHz dongle or through a direct connection. Compared to many other brands that boast of the sound stage, surround sound technology but cost a lot of money, the SkullCandy PLYR1 provides all these features at a lower price point. However, we felt the headset was too plastic and underbuilt in our hands. Would have been good if they invested a little more time beefing up the overall construction. The microphone isn’t capable of separating voice from ambient noise, and so if you game in a noisy environment, your buddies might just mute you altogether. Nevertheless, this headset is a good option if you want something cheap without compromising on sound quality. Good design with wireless connectivity. Works with all gaming platforms. Small size makes it uncomfortable for folks with bigger ears. 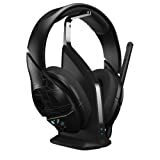 Having decided to buy a wireless gaming headset, you now have a lot more questions to answer before you can pick the best wireless gaming headset. There was a time when wireless headphones were so far and few in between that you knew which one was the best. Today, almost all the great gaming peripheral makers and audio equipment companies design and build a brand new wireless headset every year. Probably the first step to buying a wireless gaming headset is to understand your priorities. What exactly are you after and why did you choose a wireless headset in the first place? Obviously, freedom of movement was a major reason to go wires free. However, was it also a conscious decision due to the gaming console you have? If that is the case, then you must remember that not all wireless devices automatically connect to every console. Finally, before going through our exhaustive checklist to pick the best wireless headset for gaming, decide whether you want to use the headphones for more than gaming. Will you listen to music from a smartphone or your PC? What about watching movies in surround sound? These questions will help you narrow down on the best wireless gaming headset. A super comfortable headset that just melts around your ear, cocooning you in delightful surround sound experience is useless if it doesn’t connect to your preferred gaming machine. Yup, wireless technology isn’t a one size fits all solution. You probably know a few of the wireless technologies used in gaming headsets but aren’t aware that there are other modes of wireless communication too. Bluetooth headphones are easy to locate and don’t cost a lot. They connect with any device that has Bluetooth capabilities. It includes smartphones, television, computers and gaming consoles. The only requirement is that the instrument you wish to stream from should have Bluetooth technology. In gaming realms, Bluetooth is not a bad option provided your console supports it. The oldest generation of wireless devices relied on infrared wavelengths, and though this method has severe limitations, you can find cheap devices still relying on IR comms. Unfortunately, IR headsets are just the worst. Never opt for IR headphones. These are the headsets that most gamers and majority of surround sound devices use. Ultra-High Frequency headphones, as the name suggests, relies on high frequency waves above 2.4GHz to relay information between the dongle and the headphone. Yes, such a device uses a USB or 3.5mm Adapter as its interface with whatever it is you wish to connect with. We would suggest picking UHF headphones if you want to enjoy surround sound experience, regardless of the console. If your gaming console does not support USB connectivity, get an adapter that works with your device. Now that the technical stuff is out of the way let’s discuss on personal preferences. We like our headsets to be soft, plushy and comfortable. In fact, any headset that appears flimsy immediately fails our tests. Ergonomics isn’t about how things look but how comfortable they are to use. A headset can look like pins and needles but if it sits comfortably around your ears, doesn’t irritate after minutes and feels lightweight after hours of gaming, it is an ergonomic headphone. We test all our headsets by wearing them for hours and then exchanging various headphones around the office. Those that get the most thumbs up score heavily on our ergonomics test. The lesson here is that ergonomics is all about personal preference. What feels right to your friend might not sit perfectly over your ears. Another ergonomic consideration is the age of a headphone. Brand new earpieces tend to be rigid and don’t flex enough. Sometimes headphones can feel uncomfortable for a day or two. If you buy a new headphone and don’t like the fit, wait a couple of days before requesting a return or replacement. Are you an audiophile? If you want the highest quality sound reproduction, then surround sound just won’t cut it. Surround technology is achieved through significant digital processing of the audio signature, and this will always reduce the overall quality of signals. However, if gaming is all you intend to do with your headphones, surround-sound is always a benefit. With surround sound technology, you get a 360-degree spatial imprint of the gaming environment in your mind. It helps visualize approaching footsteps, bullets, grenade throws in FPS games and can work to your advantage. However, if you play RPG or online games surround sound will only produce a fuller background score. Again, it boils down to personal preference and how much you value authentic reproduction of sound. Stereo has the highest quality as it undergoes the least processing before reaching your ears but will lack a complete experience. Surround sound, on the other hand, needs heavy processing and naturally, costs more money and technology. If you are on a tight budget, we suggest taking a good stereo gaming headset. You won’t lose a lot of spatial reproduction though you get high quality, which to some of us matters a lot more than the full feeling of surround sound. Frequency response in technical terms refers to the spectrum a headphone can reproduce. The best wireless gaming headset can process a larger range of frequencies, and though this topic is still hotly debated, most agree that a wider frequency response results in excellent sound reproduction. The human ear isn’t designed to process a massive frequency range. Besides, minor frequency differences don’t register because we are naturally finetuned to reduce aural processing down to the bare minimum since we rely more on our visual world. Hence, anything that can accurately reproduce sound within the range of 20Hz to 20KHz is good enough for gaming. The best wireless gaming headset 2017 models can push boundaries in the range of 10Hz to 22KHz but remember this is only a superficial gain that you probably will never exploit to the fullest. Instead of seeing the hard numbers such as frequency response, a better way to quantify the sound signal of any headphone is to ask how different the sound signature is. The sound signature includes frequency response, spatial separation and surround sound. Together, they give you a fuller experience of everything around you. As a gamer, you will spend a good amount of time communicating with fellow players online. If you hate hearing static on the other side of the line, then you know what a bad microphone sounds like. Your goal is to avoid inferior quality mics at all costs. Do this not just for your sake but everyone in the online gaming world. The best wireless headset for gaming will always give you a mic that reduces ambient sound and catches every single word you speak. Noise cancellation, interference and crosstalk elimination are a few fancy terms to watch for. They help deliver a crisp crystal-clear sound that your buddies will love. Unfortunately, good mics cost a lot to make, and only expensive headsets tend to have precise microphones. If you game on computers, we suggest getting a separate microphone and investing in a decent set of wireless headphones. Some headphones come with their own sound mixers either as a separate add-on or built into the unit. Many argue that this helps configure sound as you game but to us, it is more of a hassle as you can’t decide on what you want. Besides, audio mixing technology means your headset or an adapter reprocesses sound before you hear it and this can result in yet another loss of quality. To us, the best wireless gaming headset is one that doesn’t rely on external mixers but uses the sound received from the gaming unit to deliver crisp audio. A good wireless headset will feel right over the ears, provide sufficient clarity and have a microphone that doesn’t distract from the game. The best wireless gaming headset is, therefore, one that doesn’t cost too much and somehow overdelivers. We have researched for you, but if you want to conduct your own experiments before deciding on the right headphone, hopefully, this guide will serve as a beacon. Remember, the best wireless gaming headset is a subjective decision best made by you.